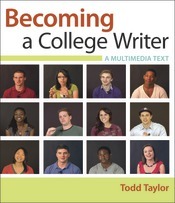 Based on 100 interviews with students who had recently finished first-year writing, Todd Taylor’s groundbreaking multimedia text is shaped by student writers like no other textbook before. Their words and voices—in brief videos and example texts—create a conversation about writing that asks students to engage with other college writers personally, learning from their challenges and successes. Conceived as a multimedia text in LaunchPad from the outset, the brief, modular chapters are organized into four parts that support the best practices and content areas in the CWPA Outcomes Statement — Rhetoric, Context, Process, and Convention — so that you and your students have just what you need in one resource to support writing, working with sources, and multimodal composing.